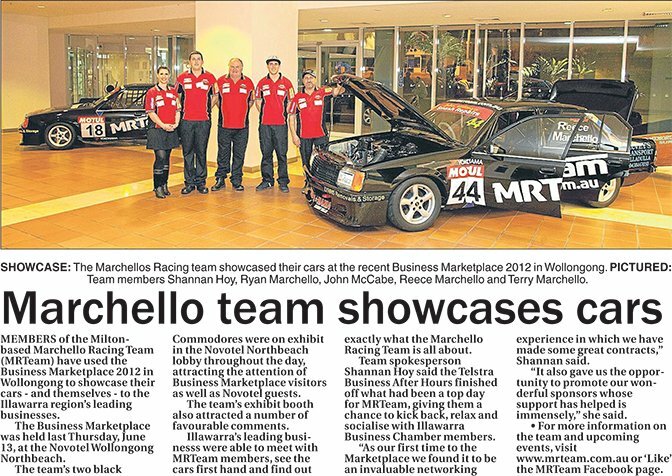 MEMBERS of the Milton-based Marchello Racing Team (MRTeam) have used the Business Marketplace 2012 in Wollongong to showcase their cars - and themselves - to the Illawarra region's leading businesses. The Business Marketplace was held last Thursday, June 13, at the Novotel Wollongong Northbeach. The team's two black Commodores were on exhibit in the Novotel Northbeach lobby throughout the day, attracting the attention of Business Marketplace visitors as well as Novotel guests. The team's exhibit booth also attracted a number of favourable comments. Illawarra's leading businesss were able to meet with MRTeam members, see the cars first hand and find out exactly what the Marchello Racing Team is all about. Team spokesperson Shannan Hoy said the Telstra Business After Hours finished off what had been a top day for MRTeam, giving them a chance to kick back, relax and socialise with Illawarra Business Chamber members. "As our first time to the Marketplace we found it to be an invaluable networking experience in which we have made some great contracts," Shannan said. "It also gave us the opportunity to promote our wonderful sponsors whose support has helped is immensely," she said.